These Echo-quilting clips have been specially developed for quilting with the adjustable Ruler foot # 72 and Ruler foot #96. They are made of solid plastic which is scratchproof and anti-static. Therefore, the surface always remains free of scratches and lint. When working with the Echo-quilting clips, you quilt around a motif to have it framed, for this purpose, the clips are guided in free-motion or along a plexiglass ruler. This technique is called ‘echo quilting’. With the BERNINA plexiglass rulers and the various spacings of the echo-quilting clips, decorative quilt patterns (such as ‘crosshatching or ‘piano keys’) can be created in the easiest way. Due to the lasered markings, the clips can be exactly positioned and guided. Perfect patterns will succeed before you know it! 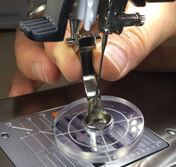 The transparent Echo-quilting clips can be clipped easily on the sole of the Ruler foot. To attach the clip to the foot sole in the simplest way, lay it on a solid surface with the markings facing down and then press the foot onto the clip from above. Please make sure that the groove on the foot sole is aligned with one of the marking lines. Remove the foot from the machine before you remove the clip. Otherwise the ruler foot is likely to get bent. You can remove the clip using your hand or any tool. Hold the foot with one hand and remove the clip from the foot by a circular motion downwards using the other hand. widened. Afterwards the clip can be removed easily.